An atmospheric and intelligent sci fi/drama, Another Earth is an exquisite example of film at its finest. This is a must see. 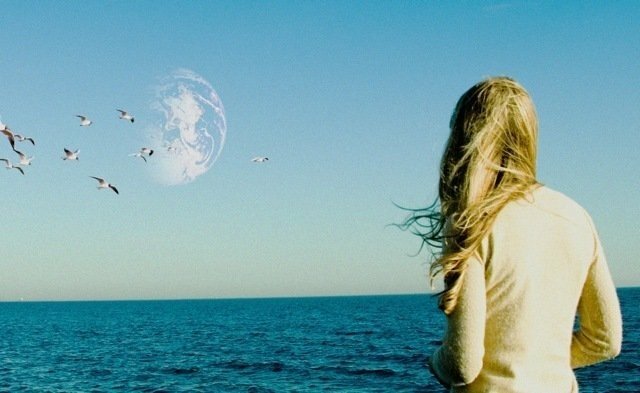 An atmospheric and intelligent sci-fi/drama, Another Earth is an exquisite example of film at its finest. Not only does it successfully meld sci-fi themes with a naturalistic filming style, but it uses sci-fi elements as a vehicle for deep metaphors of self-reflection, loneliness, and redemption. After debuting at Sundance earlier this year, Another Earth was picked up by Fox Searchlight and is now out in theaters. Naturally with a sci-fi there has to be a basic suspension of disbelief. Another Earth does throw some rather outrageous sci-fi concepts at the audience, but the intelligent script and delicate poetry of metaphor keep it from being silly. The story starts out with voice-over narration, as main character Rhoda (Brit Marling) talks about her future. She has been accepted to MIT at 17-years-old, and the audience is treated to shots of her making merry with friends at a party in celebration. After the party she’s driving home, her future full, and she hears a DJ on the radio talk about a newly discovered earth-like planet in the night sky that looks like it could support life. The DJ tells everyone to look out at the night sky and find it, a blue spot right next to the North Star. Rhoda cranes her head out of her window to try and get a glimpse of it and runs a red light, crashing into a car driven by a young family and killing the mother and her five-year old son. The story jumps ahead four years, and audiences see Rhoda sitting in a prison cell. It’s the day of her release, and we watch as she somberly goes through check-out and gets picked up by her mom and dad and teenage brother. Everyone is trying to act like nothing has changed, but Rhoda is obviously a different person. She’s introspective and quiet, clearly depressed and eschewing society in general. The earth-like planet has traveled closer to the earth in the last four years, and now is a permanent fixture in the sky as it has begun to orbit the earth like the moon. Everyone is talking about what has been dubbed “Earth 2”, and scientists are scrambling for answers. It turns out, now that Earth 2 is so close to Earth 1, scientists have discovered it is an exact duplicate of earth, down to continental positioning and even cities. A mirror image. No one knows how or why it came to be there, but then those aren’t the questions Another Earth is really about. When Rhoda’s little brother tells her about a planned trip to Earth 2, and a contest offering one free ticket on this first voyage, Rhoda becomes obsessed with the idea of going. Meanwhile, she takes a job as a janitor and begins stalking the surviving father of the young family she killed in the crash. The young father involved in the accident, John (William Mapother), was thrown into a coma after the crash, and when he woke up he was tragically alone and beset by terrible headaches. His life has gone downhill since the event, and when Rhoda looks him up she decides to come clean and admit responsibility for killing his wife and child. Only she loses her courage once she’s at his doorstep, and instead pretends to be with a maid service and offers to give him a free trial cleaning. The inevitable happens; Rhoda begins cleaning his house, and her presence has a healing effect on him. She also begins to open up with him, and they begin helping each other find some happiness. Of course this bubble of happiness can’t last, and things come to a head when Rhoda wins the ticket to Earth 2. She comes clean with John about her involvement in his family’s death, and also finds a way to redeem herself. The emotional core of Rhoda‘s journey to self-acceptance is the compelling movement of this film. The sci-fi backdrop however, allows her character to ask certain questions and face certain truths, and is therefore integral to the drama. Without the very personal story, this sci-fi film would have failed due to some logic leaps, and hard sci-fi fans will definitely take exception with these lapses. The atmosphere of the film is reminiscent of other sci-fi dramas, like Never Let Me Go. There is a tragic air, and the heavy emotional drama would be overwhelming without the intriguing sci-fi elements offering a novel perspective, and a chance for philosophical/metaphysical internal dialogue. Taking the sci-fi elements on their own, there’s no explanation for why Earth 2 suddenly appeared, or why it traveled to Earth 1 and began to orbit it. When scientists discover the new planet is inhabited with our exact duplicates, it allows for some great discussion on quantum physics concerning parallel dimensions, and the disturbance of synchronicity by random events. The film develops this great interior dialogue via radio programs and news clips that run in the background of most scenes. We are treated to plenty of informative exposition this way, as well as philosophical questions like “are we alone?“ and “what would you say if you met yourself?“ and “what it is our place in the universe?”. Director Mike Cahill elicits some delicate emotion, and balances a naturalistic filming style with his sci-fi elements. Sometimes filmmakers assume a sci-fi film must have futuristic resonance, from settings to environment to angular fashions. Part of what works in Another Earth is that there isn’t a hint of futuristic sleekness, and yet the intimate grainy shots and naturalistic style work, even with the image of a duplicate earth hovering in the evening sky. Marling’s performance shined under this artistic film direction. She delivered a nuanced and honest portrayal of a girl broken by self-loathing and regret. The character of Rhoda could have come across simple and obtuse, due to her genuine goodness, but Marling brought some amazing depth and subtlety to the role. Mapother wasn’t too bad as the grieving father, but he was outshined by Marling and the match-up didn’t seem balanced. I’m sure, given the low budget of this film, that the film’s style was in may ways a necessity. Its experimental nature–the extreme close-ups, the grainy night shots, and the angled/partially obscured camera work–all augmented the emotional intensity of Rhoda’s story. And Cahill also continued with established metaphors of reflection via artistically composed shots, like filming Rhoda in reflective surfaces like window panes or rear view mirrors. The beauty of the story is also thanks to Cahill, who co-wrote the script with Marling. As good as it is, it does sometimes get so mired in melancholy and drama that the pacing suffers, and the film begins to drag. The slow build allows the audience to join Rhoda on her journey of “self discovery”, though the lack of action may turn off some potential viewers. I have to admire, after everything is said and done, the poetry of a near-perfect ending. It’s one of those endings that is written so well that it leaves many things up to interpretation, without being lazy or making no sense. I had been worried up until the last scene about the ending, and given the indie genre-film problem with getting endings right, and the limited budget, I was sure I would leave the theater unsatisfied. But all my worrying was for naught. This film has depth and intelligence, and now that it’s out in theaters I suggest everyone go out and support this kind of innovative and subtle filmmaking.